Messages can be sent from one terminal to another specific terminal or to all terminals. 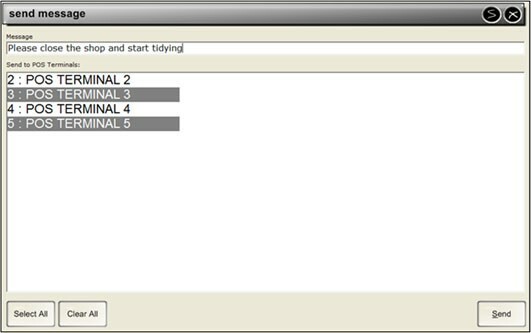 The function can be programmed to a default message pre-set, or the operator can create a custom message on the fly. Messages can be used for security and faster service between POS terminals. Messages will be recorded in the Activity Log, and all messages, either automatic or manual are limited to 50 characters in length. Messages can be sent direct from the POS Screen, or composed from the Back Office. Any staff member is able to send a message from the POS Screen if they have access to the buttons location. Any staff member can also send a message from the Back Office provided the User that is logged in has access to the menu.